Issue 23 of Mind MGMT is here to remind you — we are all forgetful sometimes — that this is a series about many things, but focused on Meru; she is the main character, and don’t you forget again. Unlike when the monk was able to see her as a majestic warrior, the reminder is done differently this time, but the effect is similar. 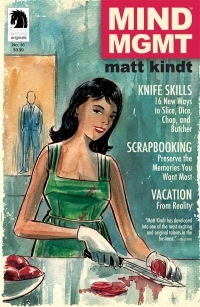 It is easy to get caught up in the other aspects of Matt Kindt’s fascinating, lovely series about miserable people with fantastic and unique mental powers. Powers that contribute to their misery and woe. So a gentle, or ferocious, reminder is needed at times. 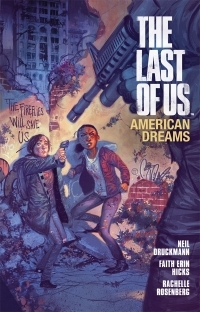 So, The Last of Us: American Dreams, is based on a recent hit video game. This has been happening a lot lately. Like, a lot a lot. It’s also co-written by Neil Druckmann, who is the writer for the aforementioned video game: The Last of Us. He is the creative director for the game and has written for a few other big budget video games. Now, the story lines of video games have come a long way since Doom, or even Quake. In 1998, when Half-Life was released, it was hailed as a landmark in storytelling in an FPS. Since then, the quality of the story has become more central to the quality of game. You know this, I know this, anyone that is even remotely into gaming knows this, and I don’t need to make this a recent history recap. Still, this smacks of a commercial cash-in, and one that serves only to sell a new action figure, or some such, and eke out a few more dollars from the beleaguered masses. Hooray. But it isn’t. Not really, anyways. Faith Erin Hicks (Friends With Boys), has been gaining popularity for a bit now, and while I wouldn’t say this is the culmination of that, she isn’t Alan Dean Foster, or a similar warm body contracted for a product tie-in. What she and Drukmann have managed to create is a teenage-rebellion story enmeshed in the post-apocalyptic world of a zombie-infection outbreak. In many ways, Matt Kindt’s Mind MGMT is a rather haunting look at memory, and the damaging manipulations and gaslighting characters have to contend with from external powers. 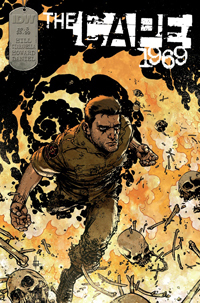 The first six issues alone stand as one of the more compelling mind-fucks in recent memory (along with being a statement on desperation). 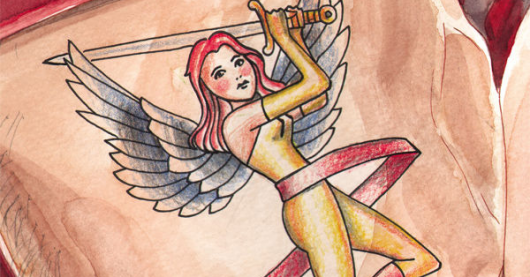 In issue sixteen we get a more thorough telling of Julinae, the woman who killed her family, purportedly, and was the subject of Meru’s first book. Her story has been hinted at on the margins (quite literally, and sorry) and discussed some through the proxy Meru’s own tale, but here she finally gets the spotlight, and like many of the threads introduced, her revelations have a vital importance to the primary story. Oh why, hello there, all of you assumedly beautiful people! 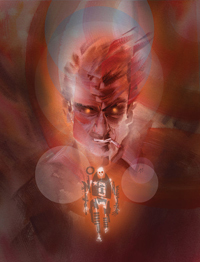 So, we’re trying a new little something here at Geeks of Doom by having a conversation between a couple of writers (Peter AKA Cashmere Smoking Jacket & Michael AKA Spartacus!) about certain comic books, projects, and the like. This may be a format you’re familiar with from around the web, or it might be a brand new thing to you. Either way, we hope you enjoy it, and please, leave feedback and suggestions at the bottom of the page; we’d love to hear from you! Also, though it probably won’t burn your retinas or anything, please consider yourself duly warned of the use of adult language below. 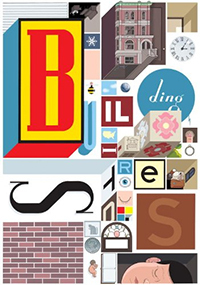 So, let’s open up our inaugural chat by talking about the latest release by Chris Ware, a cluster of elements that add up to a thing called Building Stories. Everyone has bad days. We all recognize this in the abstract, that bad days are a universal experience. However, a bad day is also very personal, a solitary experience that leads us to say such self-centered things like: “why this happening to me” and “it’s not fair,” while rebuffing commiseration from others by declaring “You don’t understand!” We know this isn’t true, because if the rule holds that everyone has bad days, then people understand, but it doesn’t feel that way in the moment. 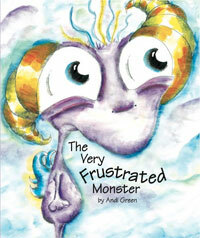 This experience is the premise of The Very Frustrated Monster, latest in the series of WorryWoo monsters books by Andi Green. Each book in the series follow a different WorryWoo creature with a particular emotional problem, like confusion or insecurity. 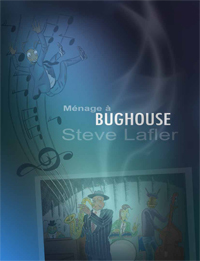 Steve Lafler spent twelve years (1992-2004) writing Bughouse, during which he explores so much of the characters and the world, that it can be tough to encapsulate. The book follows the virtuosic Jimmy Watts and the other members of his band, Bughouse, as they rise through Bugtown’s (read: NYC) music scene during the jazz and ragtime explosions. Now, all three of the Bughouse stories – Bughouse, Baja, and Scallywags – are collected in this new omnibus from CO2 comics. Although he initially wanted to deal with the intertwinement of drug culture and the music scene, he also wants the book to be fun, and so the stories are light and breezy. So, have YOU been reading Fatima by Gilbert Hernandez (Love and Rockets)? 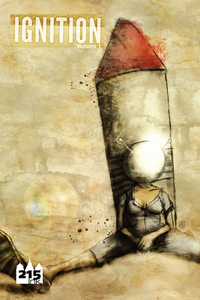 No seriously, have you been following this madcap adventure through space, time, and zombies? I know that zombie storylines have been spreading in pop-culture like… a plague that is unrelated to zombies. Let’s just say its spreading like a Contagion. I don’t actually think it’s necessary or wise to list off all the zombie-related media out there right now. I mean, really: when Brad Pitt is the lead in the $125 million dollar adaptation of a highly acclaimed zombie novel by the son of Mel Brooks, I think it’s possible to say that a saturation point has arrived. That The Walking Dead is a best-selling ongoing comic, and the most popular show on a cable channel that Mad Men also calls home, AND apparently has certain character prologues being novelized, means I think we can throw out ‘possible’ and replace it with ‘redundant’. When I feel confident that I can mention the zombie preparation campaign by the CDC without linking to it because I’m positive everyone and their unborn (zombie, obviously) children have heard of it already, well that’s just straight tautological. Wait, so why read this mini-series, which closes this month? Oh right, because its awesome.